Mary Alice Cooper of Priddis, Alberta, died in hospital on March 26, 2019 after a short, heroic struggle with cancer, surrounded by her loving family. Mary Alice was born on September 15, 1934 in Lloydminster, Saskatchewan and adopted by George and Leafa Munro of North Battleford. Her father, a civil engineer, moved her family to many towns and cities in Saskatchewan before settling in Regina, where she eventually became a teacher. In Regina, she met Robert (Bob) Peter Cooper, whom she married on July 19, 1958. Figure skating was a lifelong passion. She was the Western Canada novice champion as a young woman, and later became a provincial level judge in both Saskatchewan and Alberta. Mary Alice and Bob followed his job with Imperial Oil to Calgary, Regina and Toronto. Upon retirement, they moved to Priddis Greens, Alberta, where she loved to entertain family and friends in a home she adored. Mary Alice was an outdoor enthusiast. 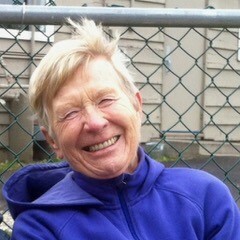 She loved to cross country ski, golf, hike and garden, and did so well into her eighties. Traveling extensively, both to visit their children and to experience other places, Mary Alice and Bob loved many countries around the world. She embraced new cultures fearlessly, appreciating and enjoying new ideas, but it was the people she encountered, no matter what language they spoke, that were always most important to her. Mary Alice delighted in serving the people in her community. She was very active in her church, worked for the Food Bank and Meals on Wheels, Inn From the Cold and numerous other charities. She was a beloved wife to Bob, mother to Jill McIntyre, Graham Cooper (Sandra), Catharine Carson (Kevin), and Ian Cooper (Emma), Grandmother to Genevieve, Rob, Annelies, Craig, Rebecca, Jesse, Claire, Hannah, Maeve and Josie, and Great Grandmother to Margaret. She also had a loving extended family that she discovered later in life, including brothers Jim, Bob and Lorne. Mary Alice was a bright spark of joy in this world. She had a gift for making people feel welcomed and special. She loved her family fiercely and adored her husband, Bob. Her presence was always a welcome gift and her smile lit up a room. She will be so intensely missed by all who knew her. Please join us at Grace Presbyterian Church where she was a devoted member (1009 15 Ave SW) on April 4, 2019 at 2:00 for a memorial service to honour the life of this strong, loving woman. If friends so desire, and in lieu of flowers, donations in Mary Alice's name may be made directly Doctors Without Borders (551 Adelaide Street West, Toronto Ontario, M5V 0N8; 1-800-982-7903; (www.doctorswithoutborders.ca).